One recent day at the Brooklyn Free School, the "schedule" included the following: chess, debate, filming horror movies, and making caves for Teenage Mutant Ninja Turtles. Not that the students had to go to any of these sessions. At this school, students don't get grades, don't have homework, don't take tests, don't even have to go to class. Unless they want to. "You can do basically anything at any time, and it's just a lot more fun because sometimes when you need a break at regular schools you can't get it," said Sophia Bennett Holmes, 12, an aspiring singer-actress-fashion designer. "But here if you just need to sit down and read and have time to play, then you can do that." "Free schools," which had their heyday decades ago, operate on the belief that children are naturally curious and learn best when they want to, not when forced to. Today, the approach is getting another look from some parents and students tired of standardized testing, excessive homework, and overly rigid curriculums in regular schools. "Every kid here is definitely motivated to learn something, there's no doubt in my mind," said Alan Berger, a former public school assistant principal who founded the Brooklyn school, which launched in fall 2004. "Our belief is that if we let them pursue their passions and desires, they'll be able to get into it deeper. They'll be able to learn more how to learn." Hundreds of free schools opened in the U.S. and elsewhere in the 1960s and 1970s. Most shut down, but some, such as the Albany Free School and Sudbury Valley School in Massachusetts, have persisted. Overall, it's unknown how many free schools operate today. The ones still in operation often use a "democratic" model, giving students a say in running the institution. At the Brooklyn Free School, much of that decision-making occurs in a mandatory (yes, as in required) weekly gathering called the Democratic Meeting. Here, students air grievances, pose challenges, propose rules and set policy. Even the youngest kids have a vote equal to staffers. One agreed-upon rule? No sword-fighting allowed inside. The school — granted a provisional charter in 2004 by the state to run as a private educational institution — occupies two floors of a Free Methodist church. Students are required to show up for a minimum of 5 1/2 hours a day, partly so that the school can meet legal definitions, but what they do with their time is up to them. The student population — 42 students, ages 5 to 17 — is diverse racially, economically and in terms of ability, and the students are not separated by age. 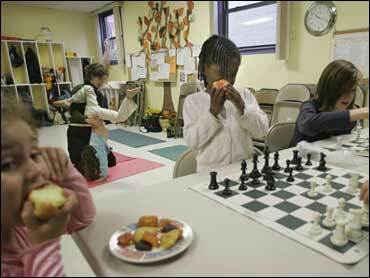 On any given day, a student may be playing chess, reading a book, practicing yoga or helping mummify a chicken. The day after the Nov. 7 U.S. congressional elections, one group listened to President George W. Bush's press conference on a radio, while the sound of the younger students' feet rattled the ceiling. Even among some champions of alternative education, free schools are considered a bit too radical. "You don't throw the baby out with the bath water," said Jeanne Allen, president of the Center for Education Reform, a leading advocate of charter schools. "You don't get rid of all structure and standards if you want your child to be able to deal with all different settings." Others say free schools could gain popularity if the emphasis on testing and regimented curriculums keeps up. "Not only is there more interest, this is the wave of the future," said Jerry Mintz, director of the Alternative Education Resource Organization. "The other approach doesn't work, and everybody knows it." The Brooklyn Free School isn't free in the financial sense. Tuition is $10,000 a year, but many parents just give what they can. There's a waiting list of about 35 students. Watching the change in her son, David Johnston, has been worth the risk for Randy Karr. While David did well "statistically" at previous schools, he hated going, sometimes crying when she dropped him off. Getting him to do homework was a struggle, and in Karr's opinion, the homework was useless anyway. "There's very little about learning that goes on in school," Karr said. "A lot of it is being still, being quiet, not talking to your neighbor, not moving around too much. Especially if you're a boy, it's lethal." At the Brooklyn Free School, David, now 12, is blossoming. He helps run a class on pharmacology and carries a notebook where he writes down things he's learning. But what about the basics? Long division, spelling, algebra? Is it enough to let a child to decide when to learn those things? This concern is there, and a few parents use outside tutors for their children, Berger said. Some students said the flexibility made sense for the youngest and oldest, but not as much for those in the middle. "I feel like they're definitely going to have a hard time with college, where you have to sort of do that sitting down and shutting up thing," said Victoria Rothman, 17, a public school refugee who now spends much of her school day studying music. "There are kids who sit here and play video games all day. I'd put a limit to that or ban it." Others disagree, noting most adults can barely remember, or rarely use, most of what schools pounded into them. Experts say it's nearly impossible to figure out how successful free schools are. While some report that many of their students go on to college, their descriptions of alumni "success" tend to be holistic and not numerically driven. In some ways, as the Brooklyn school evolves, it is becoming more structured. Students will soon have to meet a set of graduation "requirements," where they must present a portfolio showing proficiency in the areas such as communication, investigation and reflection. But the definition of proficiency, like much of the school, is flexible.